In my 15 years of developing software, I’ve realized two things excite me. Making money from my work with cool technology. #2 isn’t as easy as it should be and that’s a big problem. So… this summer some friends and I set out to try and solve that problem. Last month we wrote a blog about phase one. In this blog post, we’re pleased to announce phase two. Here we’ll walk you through the process of getting started, setting up a Chatfuel or Node.js integration, training your product database & linking your chatbot settings to your Amazon Affiliate ID. You will need to do a few things before you’re able to start monetizing a bot empire. The first thing you need is a bot, if you have one great, if you don’t then visit Chatfuel.com and sign up. Use one of their helpful templates to get started quickly. Next, head over to cashbot.ai and get started, you’ll create an account via email or Facebook ID. After you’ve created an account, you’ll need to register an application or a chatbot within the cashbot.ai settings. Technically all you need to do to get provisioned an API is provide a name. You can create a description and select the integration & recommendation sources you plan to use and select submit (see Figure 1). Total time spent, 35 seconds. Figure 1. 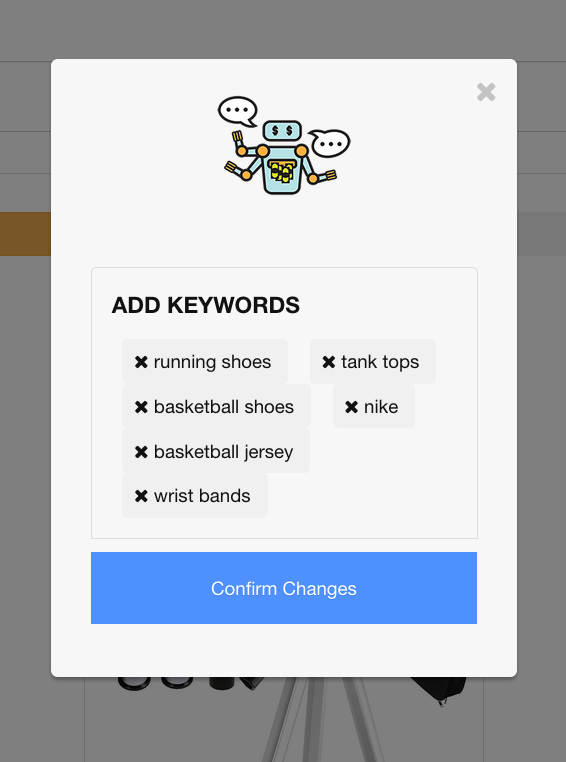 Name your chatbot, include integrations & recommendation sources optionally. Once submitted, you’ll be issued an API key. You’ll also notice tabs and set up guidance (see Figure 2). This is how you get paid, so it’s an important step. Select the Amazon tab and enter your Affiliate tracking ID. The cashbot.ai Amazon service will insert your ID into the all product that are used to make recommendations from your account. If you don’t have an affiliate account we’ve provided links to sign up (see Figure 3). Total time spent, 10 seconds. Figure 3. Include your affiliate ID and submit. Once you’ve shared your affiliate ID, it’s time to train the cashbot.ai platform on which product segments you’d like to start recommending to your users. Each chatbot begins with a large product database based on a handful of weighted parameters. 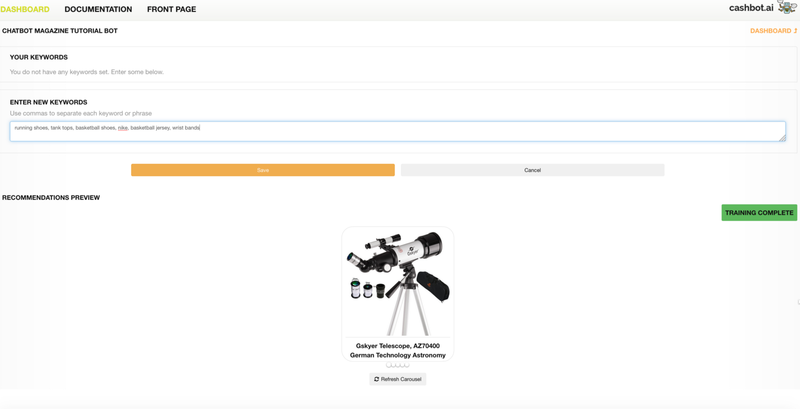 These products are shared with you in a preview field and you can toggle from product to product to preview what’s inside your database. To begin the training process, simply entering product keywords, as many as you like and select save. Confirm your keywords and your preview database will refresh. Toggle across the carousel to see your products, select refresh to see other products or add new keywords again to increase the weighted preference towards the products your keywords generated (see Figure 4, 5 & 6). Figure 5. Next we’ve entered a half dozen keywords to generate a database filled with basketball apparel. Figure 6. 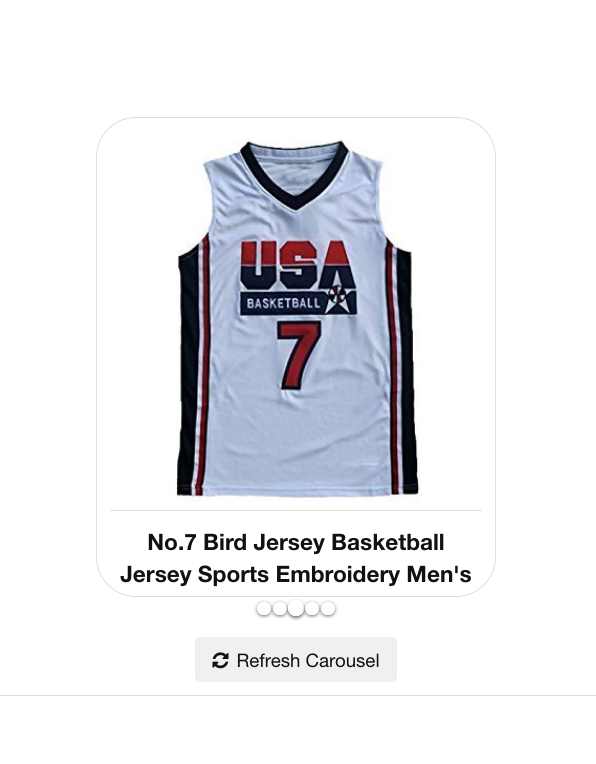 After we’ve refreshed the Carousel a couple times the database & preview contains basketball apparel & athletic gear. Go Celtics! Total time spent, two minutes & thirty seconds. 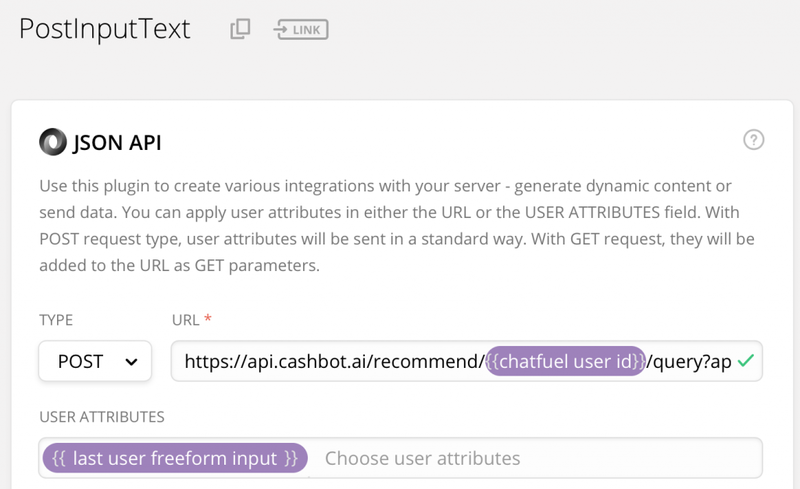 The final step is to integrate the cashbot.ai platform into your chatbot, which can be done using Chatfuel, Node.js or a RESTful interface. Your API key will be available and formatted correctly in each integration tab. Select a tab and you’ll see a handful of modifications to the style of recommendation that can be made. Each modification will automatically update the API call. Simply paste where appropriate, in the case of Chatfuel, within the JSON API plug-in(Figure 7 & 8). Figure 7. Chatfuel integration tab. Figure 8. Chatfuel JSON API plug in. Total time spent, 45 seconds. To help folks get started, we put together a Chatfuel template with all the blocks and NLP keywords set up and ready to go, all you need to do is paste your API key in each block. Email support@cashbot.ai to get a link. Yup, that’s it! Please share this with all your friends! If you run into any issues, please reach out to us at support@cashbot.ai. Thanks we love you! Love building cool things, currently working on cashbot.ai and a couple other fun projects.